A couple thoughts on the first graph. 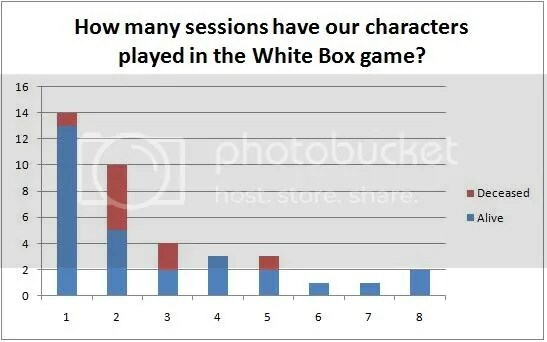 The one-session column will always be large since there are people who play one session and do not return. Other players like to play a new character each session. When I roll up a fresh, level one character, I tend to play a lot more recklessly than when I’m playing a seasoned adventured because I have little to lose. I went through three guys in Tavis’ game one evening because, for those few hours after a character is created, death wasn’t really much of a threat because an equivalent (or better) character would only cost me a minute or two of dice rolling. I think we will have more deaths in the next few sessions as we move into more lethal areas (teleport traps, efritt, astral monsters, and the beast lord) without having gained new informational resources. Wear your (low, soft) running shoes. 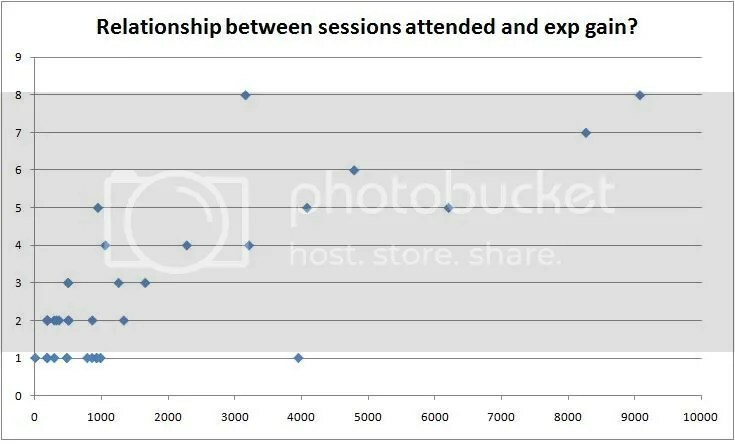 The second graph is easier to read: I see no linear relationship between sessions played and experienced gained. The majority of experience comes from treasure (as it should!) and the amount of loot we get has been wildly variable. Your best bet is to show up for as many games as possible and hope you attend one where we find a nice hoard. White box advancement is just not a direct result of “putting your time in.” It has more to do with adroitness, cooperation, and luck. The crunchy part of me is obliged to point out that the data set here is too small to provide anything in way of statistical significance, but we will not let that stop us, will we? To reinforce this, think about how excited everone was about Lydio’s special spider-sense ability during the last session. To maldoor’s fantastic analysis I will add this note about the data set: Almost all the monsters and treasures we’ve encountered have been by-the-book elements of Jaquay’s Caverns of Thracia, although I’ve been inconsistent about whether I go with their variable-dice hit points and weapon damage as written Greyhawk-style, or convert to d6 on the fly. Notable exceptions have been the wilderness random encounter with the dragon Xiurexpor and the recent run-in with Philomena and her companions. Note that two big XP-for-GP spikes came as a result of selling gems to Fflewidor that were gained by the party for trading magic items to the patriarch Zekon that were originally found in the dragon’s gullet. Philomena’s companions are also in possession of some pretty phat loot. Compared to the output of the old-school random generators, almost all the adventuring we’ve done to date has been in a region of the White Sandbox that is unusually poor in valuables and low-power magic items and suprisingly rich in super-powered ones. 2-3 years worth of kill statistics broken out by monster! We should totally find Lyle and see what else we can learn about his records.